Anguish can follow when a social worker's ethics conflict with the demands of the workplace. Its implications run deep. For Natalie, things changed when the agency where she'd been serving adults in their homes was sold to a large hospital system. "Almost overnight," she recalls, "there was a huge emphasis on increasing referrals, maximizing profit, and staff productivity." She quickly learned that productivity meant bigger caseloads and less time with clients. Faced with pressure to increase the number of daily visits, she was constantly experiencing ethical dilemmas regarding which of her clients' often multiple needs to try to meet and which to leave unaddressed. When her agency decided to reduce services to patients whose payment source was Medicaid because the reimbursement rate was too low, she was stunned. "It was like they were telling me I couldn't serve the clients who needed me most. It was a complete contradiction to why I became a social worker and blatant discrimination against lower income people." She experienced insomnia and headaches as she struggled with how to respond. "I was a wreck, constantly thinking about my clients and upset about the way things had changed. It was like I was suddenly working in a system that cared more about money than people—a system pushing me to do things that felt unethical." Anguish resulting from the collision between one's ethics and the demands of the workplace is referred to as moral distress. Merlinda Weinberg, PhD, of the School of Social Work at Dalhousie University in Halifax, Nova Scotia, Canada, believes the concept is important "because it identifies that there may be structural constraints which stand in the way of behaving according to one's sense of what is ethical." Moral distress may grow out of ethical dilemmas related to client care or allocation of resources, but its implications run deeper. "Ethical dilemmas often do not have a clear solution, and this ambiguity creates the distress," says Linda Openshaw, DSW, LCSW, ACSW, of Texas A&M University in Commerce. "Moral distress occurs when there is clearly a right course of action and the social worker is unable to take that action because of institutional or agency policy constraints." According to Frederic Reamer, PhD, of Rhode Island College's School of Social Work, "Moral distress can occur when social workers feel as if they are part of an organization whose mission and protocols seem unethical or unconscionable. 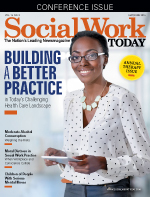 This can happen when longtime employees discover that their organization's priorities, policies, and protocols have changed in a way that deeply troubles the social worker. This may happen when agencies eliminate much-needed programs, reduce services to vulnerable clients, commit fraud, or support governmental policies that seem unconscionable." Moral distress can affect social workers at all levels of an agency or institution's hierarchy, from the hospital social worker being pressured to discharge a patient whose insurance coverage has reached its limit even though she and others on the medical team believe the patient still needs inpatient care, to the department supervisor told by upper management to falsify data needed to renew an important grant. Factors that can lead to moral distress include agency decisions about resources and programs; management directives, policies, and procedures; work culture, including harassment in the workplace; changes in agency ownership, leadership, or focus; perceived gaps between an agency's mission statement and its ability or willingness to fulfill that mission; unethical behavior in coworkers, managers, or supervisors; and mandates to document in ways that meet regulations or certification requirements but which do not accurately reflect, or intentionally misrepresent, actual services given. Even compliance with laws and regulations can cause moral distress. Reamer gives the example of a forensic social worker whose treatment helps restore the legal competence of a client who committed a crime while actively psychotic. As a consequence, that client may then be tried as though the crime were committed while he was in his right mind. Though its prevalence is hard to gauge, Weinberg suspects moral distress is an increasing problem. One reason is the clash which may occur between an agency's financial priorities and the values of a profession at the center of which are social justice and advocacy on behalf of those who are marginalized. She notes that, in a broad sense, our society does not necessarily prioritize service to populations in need or "providing a social safety net for the vulnerable, but instead the emphasis may be on using the values of the marketplace, such as efficiency and the bottom line, as the driving values even in the nonprofit world. This orientation is discrepant from the primary values of social work. This environment has led to reduced resources, pressure on workers to be more efficient—sometimes at the cost of being effective—and increased documentation that reduces the time for working with clients." Openshaw adds that moral distress can emerge in "any setting that is overseen by funding agencies that have prescribed types of care for illnesses and mental health disorders" such as when social workers try to meet third-party reimbursement criteria and "feel it is necessary to use a more severe DSM diagnosis than is actually accurate in order to be allowed to provide services." Kim Strom-Gottfried, MSW, PhD, of the University of North Carolina in Chapel Hill's School of Social Work, says that such reimbursement considerations, high caseloads, and models of care that emphasize short-term treatment can create "resource scarcity issues which can be especially vexing because there is no promising solution. Should a social worker, for example, start seeing a traumatized client, knowing that only five sessions will be allotted for care? Is it ethical to open up these wounds when the resources are simply insufficient?" She adds that moral distress may be especially acute in high-risk settings like those charged with child protection or violence prevention, where "caseloads are often too high to adequately fulfill expectations, and the price of a wrong decision could be life or death." Given the intense nature of social work and its focus on serving vulnerable populations, when workers are forced to follow objectionable policies, moral distress can easily lead to moral injury—the pain of knowing or believing that one's action, or inaction, has resulted in harm to another. In an article on moral injury, Reamer gives illustrations: "Over the years, I have encountered many social workers who are distraught about their involvement in the removal of children from their homes, lies told to clients by colleagues or themselves, termination of services to vulnerable clients who begged for more assistance, and involuntary hospitalization of people with mental illness who preferred to live on the streets" (Reamer, 2014). Left unaddressed, moral distress can cause anxiety, demoralization, and workplace alienation. Guilt about not speaking out or shame about following unethical policies can lead to depression, anger, and feelings of powerlessness. Stress may lead to somatic complaints or intensify health issues such as high blood pressure. Burnout is often the result. According to Reamer, "Social workers sometimes reach a point in their careers when they say things like, 'I just can't do this anymore—I'm now part of the problem, not the solution'; 'This is not what I signed up for. I can't be part of a system that hurts people'; 'Our new agency executive has implemented new policies that I just can't accept. It seems our goal now is making and saving money.'" Natalie found herself in turmoil as a desire to speak up conflicted with fear of being labeled a troublemaker. "It was one of the hardest things I ever went through. I was terrified if I stood up I'd become a target but sick at the thought of just going along. I was on the brink of having panic attacks and even went to a professional counselor. After a while, I realized there was risk either way. If I spoke up I might get fired, but if I didn't I'd wind up burned out and depressed." Though some social workers may find supervisors hoping to modify offensive policies, many who resist unethical demands face pressure to conform and have their concerns dismissed or ridiculed. Some even face bullying, retaliation, intimidation, or termination. This is especially likely in situations where a social worker turns whistleblower and alerts an outside investigative entity, such as the university-based social worker who hits a brick wall when advising university administrators that campus security personnel are pressuring victims of sexual assault not to report these crimes to municipal law enforcement. In her research into ethical challenges, Weinberg has found that "One of the themes that arose generally within the profession is the sense of isolation that practitioners experience when delving into and resolving ethical issues such as those which cause moral distress." In an effort to reduce this isolation, she has created Ethics in the Helping Professions, a Web-based forum for social workers to discuss these and other ethical issues, available at http://goo.gl/wLjDuP. Given this isolation and the considerable pressures that an agency can bring to bear, speaking as a voice of conscience and refusing to behave in ways that are unethical takes inner strength and moral courage. Strom-Gottfried describes such courage as "the ability to turn the distress into action—speaking truth to power, refusing to continually succumb to an unacceptable status quo, leaving a persistently untenable situation rather than acquiescing." In her research she has found that responding with moral courage often requires overcoming barriers to action such as personal discomfort, the threat of negative consequences, a sense of futility, isolation, and the diffusion of responsibility that can occur in situations where no one else is acting. Openshaw recalls Milgram's (1974) well-known study on obedience to authority that, in her words, concluded, "Few people have the resources to resist authority when they are asked to carry out actions that are incompatible with fundamental standards of morality." Strom-Gottfried believes there are "a lot of contributors to moral courage, such as influential role models, belief systems (such as those drawn from faith traditions), or theoretical orientations," which can instill confidence and fortify one's resolve. Other factors may include the extent to which such courage is important to one's sense of identity, personal narratives about the meaning of values such as integrity and ethical responsibility, a willingness to take risks, the nature and involvement of one's support system, and risk-mitigating factors such as an additional family income in the event of termination. Social workers hoping to bolster their courage will find encouragement in the NASW Code of Ethics. Reamer, who chaired the committee that wrote the current code, says there are several provisions that "provide conceptual and practical guidance to social workers who are distressed when they feel pressured by agency administrators or supervisors to behave in ways they believe to be unethical." These include, in section 3.09(d), an explicit statement that "Social workers should not allow an employing organization's policies, procedures, regulations or administrative orders to interfere with their ethical practice of social work." Talking about these issues openly in the workplace is essential. Openshaw suggests starting with peer supervision, preferably in a context where participants have an active role in determining the group's focus, agenda, and content. She also encourages social workers feeling dissonance and distress to trust that others are feeling it too. Reamer says it can be useful to find a coworker or coworkers who can be trusted to listen and help process these challenges. "Sharing one's feelings with a trusted colleague can ease the burden. This may also help social workers brainstorm constructive ways to manage the distress, address concerns with supervisors and administrators, and seek constructive change that may ameliorate the circumstances leading to the distress." Weinberg adds that, by speaking forthrightly about these issues, an individual or small group of committed social workers can remind an agency that it is not just the individual who is responsible for acting ethically but the workplace community as a whole. Though the immediate causes of moral distress are usually local, Strom-Gottfried notes that some social workers will trace them to "resource and policy decisions that are made far from the frontlines." Connecting the dots in this way may raise questions about whether to engage in advocacy beyond the workplace. A social worker employed by a prison placed under the management of a for-profit corporation, for example, may perceive negative impacts on staff and inmates resulting from new policies and procedures intended to cut costs and maximize profit. Though he may take concerns to his supervisor, he may also decide to engage in activism against regulations allowing the outsourcing of prison management to private corporations despite the fact that his employer contributes money to politicians and interest groups seeking to expand these regulations. When asked whether her social work education prepared her to navigate the challenges of moral distress, Natalie is quick to respond. "I had great professors, but when we talked about ethics it was pretty conceptual. I really had no idea how institutions could betray their professed missions and how pervasive the impact of money can be. I was clueless about how emotionally invested others, even social workers, can be in defending rationalizations which justify policies and behaviors that to me were just plain wrong." Weinberg agrees prospective social workers could be better prepared to face these challenges. "The profession does not focus sufficiently on the broader systemic, macro components that create ethical conundrums for practitioners." She urges educators to recognize "the discrepancies that often exist between the current environment and the values of the profession" and pay greater attention to the "context-situated" nature of ethics instead of being overly attached to the belief that universal principles can be applied in the same way to every situation. Reamer and Openshaw agree that it's important to go beyond a conceptual focus and that students need practical knowledge and skills to be prepared to handle these difficult situations. This includes discussing the concept and dynamics of moral distress, reviewing causes, recognizing effects, engaging in role playing, and using case studies to learn to think and act ethically while under pressure to conform to systems, agencies, or supervisors with conflicting priorities. Looking back, Natalie has some advice for social workers in these situations. "Find allies if you can. Make the case for change respectfully and calmly; don't be confrontational, but don't let them push you around, either. Offer concrete solutions if you can. If possible, bring your points up in the spirit of concern for the agency, clients, and the agency's image in the community. You might even be able to refer to goals in your agency's mission statement supporting your case. Put requests in writing whenever you can and keep a record of conversations. If your agency has an ethics committee, look into having a hearing. And if they try to convince you you're overreacting or that you don't understand the so-called 'big picture,' don't buy it." When times were the roughest, she projected into the future, imagining she was looking back. "I'd be sitting in an old rocker telling my grandchildren stories about what happened and how I acted. Did I choose job security over my integrity? It made me realize that what I did in the moment would define who I became and what lessons I handed down." Ultimately she decided to leave after her efforts failed to reverse what she saw as discrimination against the poor but which her boss claimed was just the consequences of a free market. "I have no regrets, but sometimes I wonder what I would have done if I hadn't lived in an area with other jobs, or if I had a disabled child who needed health care benefits or elder parents dependent on me to help pay the bills. It gave me much more empathy for social workers in these situations. It's easy to sit on the sidelines and say 'Yeah, I'd be a superhero,' but this is intense, confusing stuff. I believe we all have that kind of courage down deep. But I also wonder, I mean, think about it, what would you do?" Reamer, F. (2014). Moral injury in social work. Retrieved from http://www.socialworktoday.com/news/eoe_021814.shtml. Moral Courage (www.formoralcourage.com), a website supported by Kim Strom-Gottfried, PhD.